While Finding Them Homes – James Bay Pawsitive Rescue recently celebrated the 2,200th dog adoption in its short history, it had an almost accidental beginning. In September 2012, Sara Feero, a resident of Moosonee, Ontario learned that the deadline for two puppies (Patches and Willow) to find a home was near, and as is so often the case in communities with no veterinary care and few options for stray dogs, would be euthanized. Sara contacted a friend, Brenda Mueller, and together they decided to foster these 2 puppies. To find forever homes for them, Brenda contacted Julia (Jules) Dezoete in Barrie who got word out via social media about a couple of dogs available for adoption. In the meantime, Nadia Peters in Moose Factory was also looking for homes for a litter of puppies. 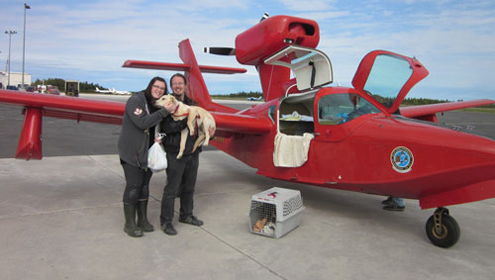 On Sept. 28, 2012, with the assistance of Pilots ‘n Paws, the dogs were brought south to Barrie and subsequently adopted out to friends and family. Although we didn’t know it at the time, that date has since been recognized as the official start of Finding Them Homes. 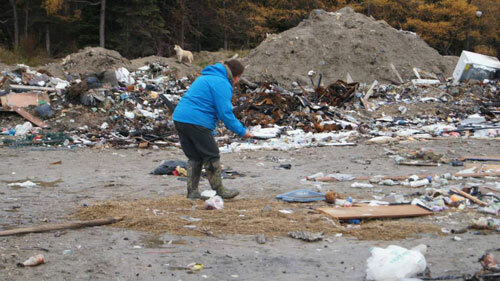 Soon, Karen Metatawabin-Wesley from Fort Albany, another James Bay area community, contacted the group of friends to find solutions to the large population of stray dogs. The only available option till that time to manage the over-population of dogs was to conduct culls. Before long, Karen led volunteers into the woods and along river banks to rescue stray dogs and litters of puppies, and with the ongoing help of Pilots ‘n Paws, Ontario Northland Railway, and dedicated volunteer drivers, many rescued dogs found their way to Barrie. As the number of dogs increased, the nucleus of an organization began to take shape. Lisa, Julia’s twin sister, became heavily involved, especially after they nursed a sickly pup, Oakley, from the brink of death back to life. He subsequently became the mascot for Finding Them Homes (and is featured on the logo). As word spread of the plight of dogs and puppies in remote northern communities without access to veterinary care, donations to rescue and provide care for them started to come in. Toward the end of 2013 it was decided to add some structure to the ad hoc group and a board of directors was created to help manage the growing volume of work. In January 2014 it was decided to apply to the CRA for charitable status and this was granted in July 2014. Finding Them Homes has now completed over 5 years of operation but it could not have reached this point without the tireless efforts of its many volunteers. Board positions are also all volunteer. The only remuneration anyone receives is the satisfaction of seeing so many dogs rescued and placed in loving forever homes. Through the donations of countless supporters, funds have been raised to conduct veterinary clinics in a number of communities where dogs could be neutered/spayed and receive vaccinations. 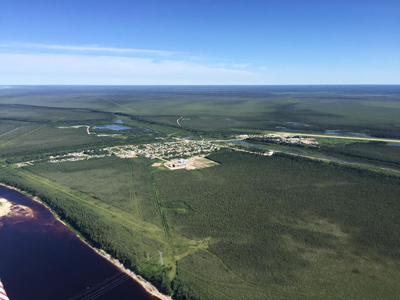 Communities in the James Bay areas that Finding Them Homes has been able to help have now become much safer with the reduction of roaming dogs. The success of these programs in the James Bay area has allowed Finding Them Homes to offer help to communities on Manitoulin Island as well as those north of Thunder Bay. Finding Them Homes is thankful to all these communities for extending a hand of friendship and helping to break down cultural barriers. Those of us who have been able to work closely with community members have appreciated the relationships that have been built as we work together for the good of the communities. Moosonee was very lucky to have a group of people start up Moosonee PUPs (preventing unwanted puppies) several years before the rescue started. Their aim was to bring in a vet and team to do spay/neuter clinics. Prior to their work there were numerous dog packs and many people, young and old, were afraid of dogs. This group helped to reduce the unwanted dog population immensely. However, there was not a specific place for unwanted dogs who were already born to go or those who were picked up by the dog catcher. This is where Finding Them Homes saw a need and decided to do something about it. 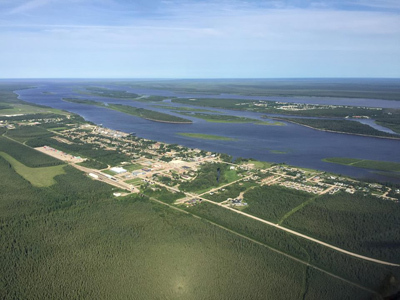 Moosonee was the first community that Finding Them Homes started in, quickly spreading to help Moose Factory and soon after Fort Albany and eventually into other communities as well. For those who do not know where Moosonee is, it is a 7-8 hour drive straight north of Toronto to a place called Cochrane, in Cochrane you take a train for 5 hours until you get to Moosonee. 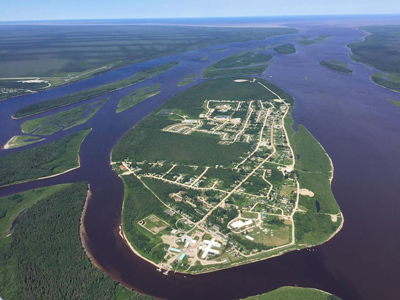 Moosonee is also the hub for the James Bay Communities on the Ontario side. There is no vet care in the community. The closest vets are in Timmins, Ontario. Since starting in 2012, Moosonee has seen the loose dog population greatly diminish. There are little to no dogs loose that are not owned. Dogs that are owned and loose are normally caught by the dog catcher and the owner is responsible for bailing the dog out within 3 days. If no owner steps forward or they decide they no longer want the dog, we are there to take the dog in to foster until it can be sent south to the Barrie area. We also gladly help community members who have a dog they can no longer care for. A success in Moosonee is that there are less children who are afraid of dogs in the community. When Brenda first moved to Moosonee in 2009 the majority of her class were afraid of dogs because of their memory of the packs. Now, most of her students do not have this fear since they never had to grow up with these pack problems thanks to Moosonee PUPs and Finding Them Homes. Although Moosonee does not have as many dogs being “rescued” from it anymore there is still a need in the community. The need is to continue to teach about dog ownership and responsibility as well as to be there for those who still need us. Over the years Moose factory has had a dog problem, now unfortunately the only way our town was able to control the growing population was by trapping dogs and putting them down by shooting them. They would then be tossed into a hole that was dug just for the dogs, it was known as the dog pit. Now I don’t know about a lot of other people but that it just terrible, I mean what if it were the other way around? Dogs being the owners of humans, them trapping us, shooting us and throwing us in a pit. Over those years, I’ve seen a lot of ” packs ” that were in heat. They were aggressive, scary and in a large group. This happened a lot in just one year! Now I’m not saying it was ALL the dogs in moose factory but the ones that were free to roam, without a collar or leash. Some just abandoned because of careless owners. But because of those careless owners I would say a large amount of those dogs ended up in the dog pit or attacked by bears & wolves. After the heat season would be over, we would then have pregnant dogs roaming around, scavenging for their next meal. When it came to birthing, they go where they feel they need to go like under shacks, bushes, under houses.. You know, places where they feel like they need to go to feel safe. Of course, they never usually are safe unless they’re in a home, with people to help them feel safe. Not everyone in Moose factory are bad dog owners, there are a lot of people that take care of their dogs but there are also a lot of people that just don’t care. After a great group of people came together to help these type of helpless, homeless dogs. Those horrid types of things has minimized by …A LOT. Some dogs transferred down south to find a home, some dogs were re-homed by proper dog owners in moose factory. Dogs were being treated for shots and being fixed because vets started to come in Moose factory to HELP OUR DOGS. People started stepping up for their pets, it helped change some people’s minds about how they should care for their pets. I, myself have 3 dogs who were given shots and my two females are fixed. I am forever grateful for that because what if my dogs had baby puppies and I gave them away? Most of them would be out there free roaming. I feel like ever since finding them homes has come together, the dogs up north have a better chance at living their lives. They would be properly trained in time, fed daily, bathed and over all LOVED. Instead of having to put down a dog we now have the choice to send them to a better home. Many dogs in moose factory don’t get a lot of love, so I would personally like to THANK FINDING THEM HOMES for taking their time to help our dogs up north. The group of people that help these dogs find a home are a great group for having such caring souls. I am so proud of the huge strides my community of Fort Albany has made in our dog management program. Our dog population is under control, we have been able to manage this for almost two years. All of our females have been spayed, most males have been neutered. Almost all of the dog population is up to date on vaccines. While in the past, the only way it seemed to manage the over population was by dog culls, this is no longer true. We have not had a cull in 6 year. It is important to understand that these were only done in extreme cases of danger for the community. No one liked them. Through social media we have been able to put an end to this. We have had 4 vet clinics, one every year! These vet clinics have helped in reducing births of litters of puppies. We have been very successful in rounding up the stray population and the dogs who lived and birthed in dens on the river banks. All of these dogs how found new and loving homes either here or down south. We could not have done this without the love, support and dedication that Finding Them Homes puts into each and everyone of the animals who have come south. I did a lot of research and in the end it was this tiny group of volunteers who stood out to me the most. Together we formed a board and were awarded the title of charity by the government. The volunteers and foster homes we have both here in Fort Albany and in the Barrie area make our rescue nothing short of outstanding! I am so proud and grateful for each and everyone of you. Our community is a testimony to the dedication od everyone on our group. I wish you all could see how healthy the dogs are in our community. Children are out playing and running and laughing. Fort Albany has a new appreciation for our dogs and for the work that we have all done. Every donation is used to it’s fullest potential, whether it is food, collars, blankets, dewormer, medications. Treats, newspapers. crates and ex pens… nothing goes unused! At times I have sat down and shed tears of gratitude, the generosity is so overwhelming. We have all worked together and altered people’s perception of first nation’s people and have changed many lives both human and canine. It has been a long haul, the work arduous and time consuming, heart wrenching even. I have lost friends and gained a whole new family, some I have not even met. We have had some hiccups along the way but have never strayed from our goals. We have learned to play hard, work hard and volunteer even harder. I am truly grateful that everyone has taken the time to get to know our coastal people, have come up, visited and seen the reality of our lives. K am so grateful for my friend Laura Mary who began all of this in our community. So thankful she got me involved. Even more grateful that we realize that it is very rare that a dog is abused, abandoned, neglected and trapped and shot. Dog rescue, rehoming, helping the communities requires a delicate balance and we learn every day to better ourselves in order to be of better service to the communities which we know and love. We do not cast blame or point fingers at those we know nothing about. That being said, I will never stop being the voice for our communities or for the dogs. Can you imagine, just for a minute, you live in a very remote community that the only way in or out is by plane or the dangerous winter roads? You are cut off from everything and must rely on each other for survival. A loaf of bread is $8.00. A quart of milk is $20.00 and a pound of ground beef is $40. With little income and very few jobs how would you feed and support your family. How would you feed your dog at $60 for a small bag of dog food? People love their dogs. They want to provide for them. At one time before skidoos came around having a dog was very important. They pulled the sleds that made hunting and fishing possible and were the only means of transportation. But now there is just a huge number of dogs, some with no owners, roaming around trying to survive. Disease, starvation, wolves all take their toll. There are rarely old dogs here. Life expectancy is about 3 years of age. People try. Keeping a female in heat is dangerous. Your home will be surrounded by packs of diogs, all waiting. How do you let your children out to play with your yard full of huge males in heat? If you let her out you can not hold them all back or fight them off, nor can the children. You build a dog house with what scraps you can find, pieces of wood and plastic, looking for insulation, anything to keep them warm in the freezing winter months. 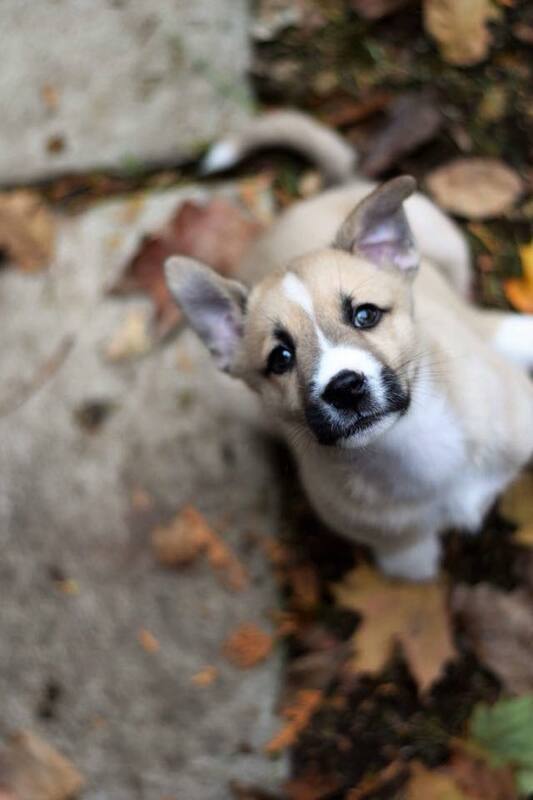 Pups born after November rarely survive. Imagine loving your dog as you do, and they get sick or are hurt, What do you do? There are no vets, nobody to give vaccinations or spay or neuter? If you are lucky you live in a community where there is a volunteer, a doggie angel who will do everything they can to help. 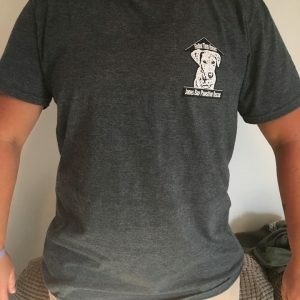 They distribute food from the feeding program, they distribute dog supplies sent up as donations, they administer to the sick and injured, but most of all they help rescue. It is a lot of work, very difficult and very expensive. Sending a crate up cost $40, a flight is anywhere from $68 to $129. But first a rescue needs to be found who has room to take just one more, who will die without help. You love your dog, you love them enough to let them go. They get the help they need to love a good life, get lots of food, have a bed to sleep on, but never to see them again. A gift of life, that is love. Without rescues like Finding Them Homes who not only pay for the crates, and the flights, but come up and get these dogs, these puppies, these dear souls who need them so bad, they will struggle, they will die, they will suffer. Supporting and working together with spay and neuter programs help save thousands of lives. Dogs can now live in peace, no longer producing puppies every six months, no more fighting from the males, reducing the dog population to a manageable level. Reducing the strain on rescues. 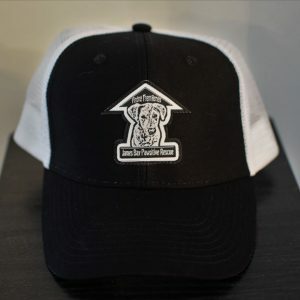 Supporting recues, supporting spray and neuter programs, supporting feeding programs, having supplies sent to care of the dogs, providing the community with a means to make a change, to make things better for the dogs. To have a life expectancy of more than 3 years. We can make a difference. 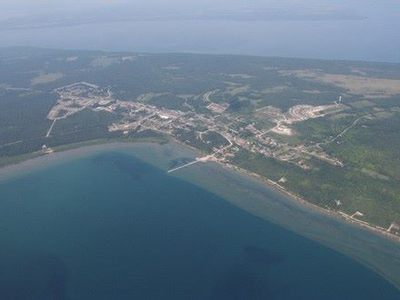 Wikwemikong Unceded Indian Reserve is situation on the eastern end of Manitoulin Island (in the waters of Georgian Bay, North Channel and Lake Huron). We are approximately 500 km north of Barrie, or 5 hours drive. Year round road access by a single lane swinging bridge in Little Current and the ferry crosses to Tobermory from May to October. 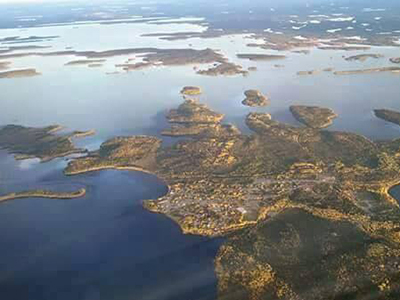 Our community has an on-reserve population of about 3000 covering a land base of about 450 square kilometers (total Band Members of approximately 4800) Besides the main village of Wikwemikong, we have several satellite communities in the outlying rural area’s: Rabbit Island, Cape Smith, Kaboni, Buzwah, SouthBay and Wikwemikosing. Over many decades, there have been several attempts to address the long standing problem of over population and free-roaming dogs. We have an old dog by-law which was passed by our Chief and Council in 1972 but never have had a way of enforcing it. Many culls at various times over many years have been done as a last resort for community safety. The local vets are in the Municipality of Mindemoya on the Island but is about 90 kms away and a majority of our community members are on social assistance without access to transportation. One volunteer has tried for 7 years to help with this issue but due to lack of community support, co-operation and other help, she could only do what ever she was able to do. Eventually, this led to a complete sense of hopelessness for Jean Flamand, almost totally giving up. In January 2014, the children were calling for help because they were scared of all the dogs, their lunches were getting stolen on their way to school and several large packs forming causing dangerous situation. The kids felt sorry for all the hungry, injured, freezing and unloved dogs. My family started helping to volunteer with rescuing dogs and finding placement off the Reserve for those in need. Then in the spring, a grade 7 class had a “Persuasive Writing” unit so they all voted and decided to try persuade the Chief and Council to do something about all the dogs. In November of 2014, the Chief and Council gave our program an allocation of funds to operate with. We take surrenders/puppies to rescues, attend emergency calls, transport to vets, distribute dog food/supplies/straw/dog houses if donated and basically offer support to people seeking assistance. We started a Facebook group (Wiky Rez Dogs) for community members to share info, get the word out of dogs in need and to take pride in the efforts that every one is attempting to do. We have a lot of community support and since January 2014, have managed to take out close to 475 dogs/puppies to partnering Rescue’s willing to help us. These are either surrendered litters or dogs, injured ones found in need of help or identified strays. Then in June, I miraculously found Karen Metatawabin Wesley in a Facebook group and contacted her for info about how she was able to do all the work she did in Fort Albany. I was amazed to hear from another First Nation’s person who did so much and wanted to learn from her and get some advise/support. She introduced me to the best Rescue Group ever, Finding Them Homes. The support, understanding, graciousness and empathy expressed by the De Zoete girls and all the fosters/helpers has been nothing but positive. It was so difficult to try ask for help from other rescue’s that blamed our culture, shamed our people and disrespected our efforts. FTH’s is helping, supporting and cheering us on towards dealing with our problem. In September 2015, we held our first Spay/Neuter Clinic in Wiky with the help from the SPCA Mobile Clinic operated by Welland Humane Society. We did 55 dogs and 22 cats spay/neuters. The Wellness Clinic saw 106, so a total of 183 pets. We are working on getting our by-law updated and our local Security Service personnel trained as By-Law enforcement officers. Once we can require all pets be registered, spayed/neutered and kept safely at home we have to continue our efforts to Rescue. Our Children are worth it as they deserve to feel safe and we have to teach them how to properly care for the four-legged family members. Our slogan is “We can fix our Problem. 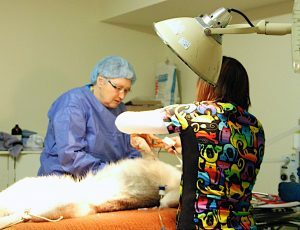 Have your Rez Dog spayed or neutered.” We are committed to finding our solution. Chi-Miigwetch to every one who fosters, donates and adopts the dogs from northern Reserves. Change is happening thanks to the kind people who love dogs! Interested in adopting a dog from one of these communities?